What is a diffuser and who really cares, anyway? Steady on, Cowboy. One dirty or blocked diffuser can bring your whole system down. A diffuser or commonly known as a air conditioning ceiling vent is the plastic bit with a grille sitting flush against your ceiling or wall. looks innocent enough, right? It’s pretty unlikely that your diffuser or vent will completely block up, but in some cases, if you have ducted air-conditioning and you close all the grilles to redirect air into just the one room (say your bedroom at night) – that can put a lot of stress on the system. You may think you are reducing energy consumption by preventing the need to cool or heat unused rooms, but that’s a myth. Closing vents will raise your energy costs. I’ll write that in bold for you. Closing air conditioning vents will raise your energy bill. Your diffuser has an air filters which keeps dirt, dust … allergens (ew!) … and debris blowing through your home. If your diffuser gets dirty quickly, there might be something up with the main air filter feeding your system (that also needs to be cleaned a couple of times a year). Your grille filters can be replaced monthly so as not to strain your system. Just pull one off the ceiling to check it. You can buy filters pretty cheaply, but make sure you measure your vents before trotting off to Masters. Behind your diffuser is the mysterious silver tentacled octopus (pictured). Her tentacles snake back to the main HVAC (Heating, Ventilation and Air Conditioning) system. Her job is to distribute the air effortlessly through your home. So be nice to the silver octopus and unblock your diffusers. If you find them unusually dirty, you might need to check the main air filter. Some vents are big enough to service a couple of rooms simultaneously. Others (e.g. 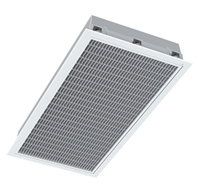 circular diffusers) are designed to service larger areas. Square or rectangular diffusers are the most common. As a general rule, you probably wouldn’t have a circular vents pumping air into a small area as it may cause a draft. Unlike round or square diffusers, long thin diffusers are usually installed around the perimeter of a room. They are particularly good at distributing air in areas where there might possibly be condensation problems – such as a wall backing on to a wet area or shower. They are also quieter and distribute the air around a room much more efficiently through a series of directable louvres. Naturally, they are more expensive. When it comes to filters, size matters! The size and design of a diffuser or vent should match the through-put of air. For instance, you wouldn’t put a simple square vent in the middle of a large room, but you might put a linear vent near the back wall and use one or two circular vents to distribute the air around a particularly large area. The more expensive diffusers can be made of steel or aluminium and, while you think this is something I can save money on, buy wisely. Plastic diffusers tend to age quickly, they are difficult to paint around and their moving parts (direction fins) are prone to break. A sturdy, reliable metal (or at least a more robust plastic diffuser) might be a better investment and give you more options when it comes to opening / shutting vents or directing airflow. As a matter of fact – and very weirdly – I’ve just been helping my girlfriend remove a couple of old filters in the bathroom and toilet. The filters are as old as the house – about 9 years – and I found them very difficult to remove. They’re not aircon filters (although we have those, too) but filters for the vent. They are supposed to be white but have become brittle and yellow with age. Because we are painting the ceilings right now, we’re probably going to need a couple of new ones. The same thing is happening to the aircon filters (we have square ones dotted throughout the house) and the wall vents (for the gas heater). When you consider that these filters are positioned to suffer the most cold or heat your aircon system can dish out – no wonder they age so quickly. It might be better to go metal. And there’s the rub. Spend a little more now, or replace your cheaper ones further down the line. I guess they’re not that expensive, but I can’t think of anything worse than looking at a freshly painted ceiling dotted with cheap, yellowing aircon filters.